This is A. A. 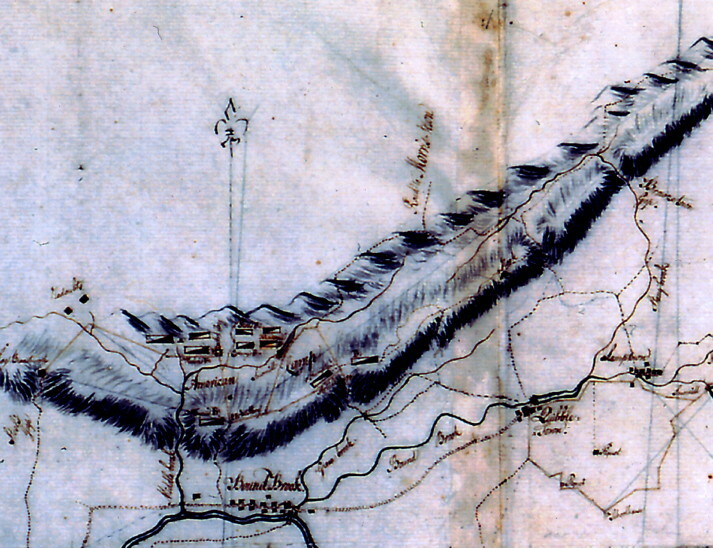 Boom's redrawn version of a 1778 map titled "Road from Quibbletown to Amboy and places by bearings". The The Somerset County Historical Society of New Jersey, (908) 218-1281. 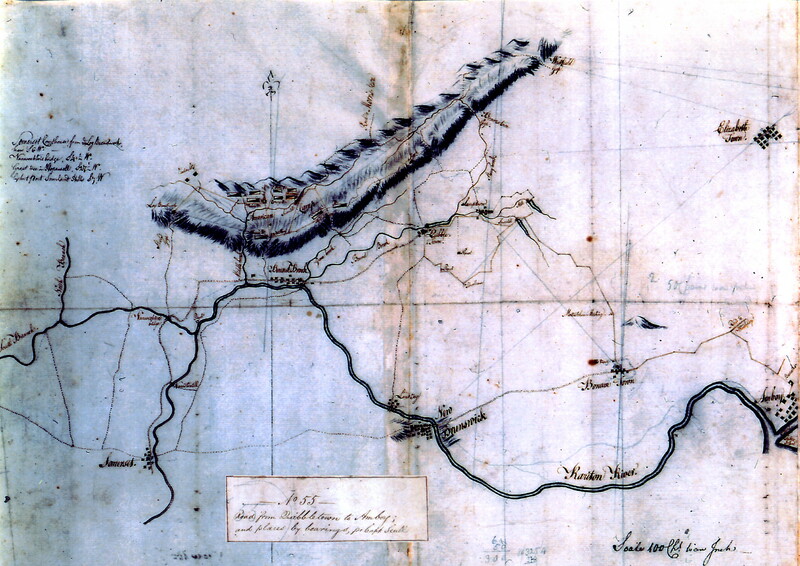 The original was done by Captain Scull (listed as Snell is some places) a cartographer in the 11th Pennsylvania Regiment, commanded by Colonel Hampton. He joined Erskine's geographers department in 1778 (Fitzgerald XI, 246; Xii 21). Robert Erskine was Washington's map maker. Quibbletown is roughly where the New Market part of Piscataway is now and Piscatawaytown was south of there. George Washington's Map Maker (New Brunswick, N. J.: Rutgers University Press, 1966). by Robert Erskine F.R.S. Geogr. A. U.S. and Assistants ; pr Capt. Scull. Military topographic map. Covers Somerset and Middlesex Counties in New Jersey and Richmond County in New York. Shows roads running through Milltown, South Branch, Raritan, Finderne, Hillsboro, Millstone, Boundbrook, Newmarket, Samptown, South Plainfield, New Brunswick, Metuchen, Bonham Town, Fairfild Union, Perth Amboy and Elizabeth. Also shows "American Camp," buildings and owners' names, landforms and streams. Shows relief by hachures. Title proper from recto is the work of a later editor--Simeon DeWitt or his assign--subsequent to 1820. Index title, both statements of responsibility, date, series title and series numbering by Erskine, but on separate index sheet filed at head of series. Watermark: "J Bassuet" and crest twice, "FIN M D" once. Badly foxed, creased, frayed and abraded. Mounted on cloth, bound and cropped, disbound and silked by subsequent owners. Cleaned after removal of backings 1999; some fill remains. Sheathed in mylar. In pencil on recto: "No 55"
In ink on verso: "Elizabeth Amboy A", "No. 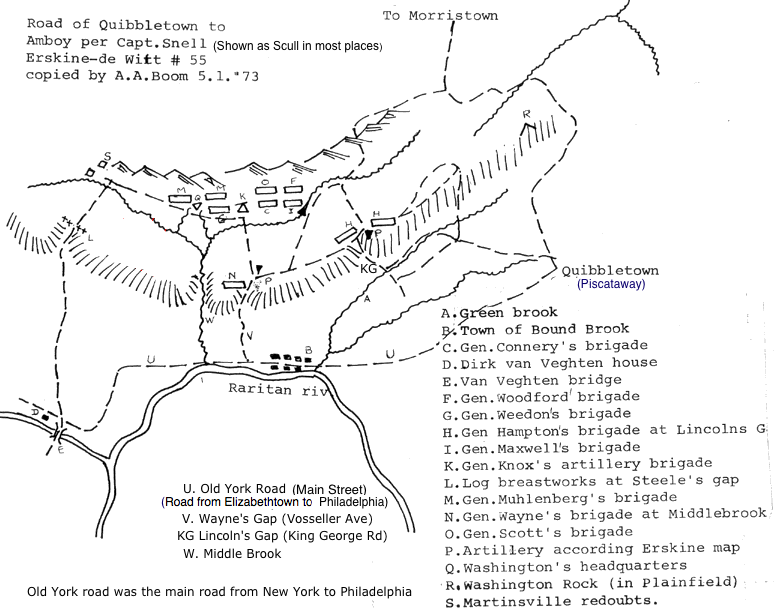 55"
Note: Liesenbein in "Report on a Preliminary Archaeological Investigation of the Alleged Site of the 1777 Summer Encampment of Wayne's Brigade at Middlebrook, NJ", 1974, p. 17, states that "No Revolutionary War map with passes labelled Wayne's and Lincoln's is known to at this time."